Haryana Police Constable Recruitment 2019 (हरियाणा पुलिस कांस्टेबल भर्ती) The Haryana Staff Selection Commission has the need for intelligent and energetic candidates for the Constable Vacant posts. So HSSC has announced the HSSC Constable Recruitment 2019 Notification for the various posts for male and female candidates. Aspirants, who want to join the Haryana Police, can go to the official website and can complete the Haryana Police Constable Recruitment 2019 Online Application form on or before the last date. Candidates are advised to check the eligibility criteria for Constable (Male & female) posts such as Age Limit, Physical details, Qualification, Online Application and more information from here. 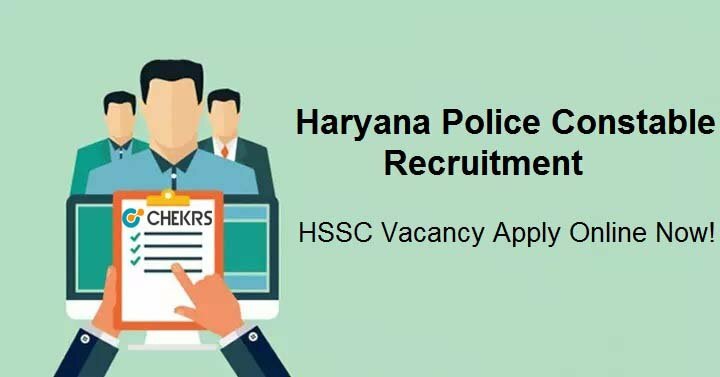 Latest Update: Haryana Police is going to release the HSSC Constable Recruitment 2019 to fill the vacant posts. Candidates can check eligibility, application dates, selection process from here. The Haryana Staff Selection Commission has announced the Constable (Male & Female) Recruitment 2019 notification to fill the vacant posts. The Haryana Staff Selection Commission has announced the Constable Recruitment Notification to fill up the vacant posts. Applicants are invited for the HSSC Police Constable Vacancy 2019 Application and must be completed the application process on before the last date. Online applications are invited for direct recruitment of under mentioned categories of posts using the website of HARYANA STAFF SELECTION COMMISSION. The candidates are strictly advised to apply Online well in advance without waiting for the last date of submission of Haryana Police Constable 2019 Online Form. Applicants who are interested in the Government Jobs can complete this task. All the interested and eligible candidates can apply application form through online mode on or before the last date. Firstly candidates can check their minimum eligibility for the Constable post. Class 12th pass certificate is the minimum educational qualification for the Constable posts for all categories. Hindi/ Sanskrit up to Matric standard or higher educations. The candidate’s age should be between 18 to 25 years. The age relaxation for the reserved category candidates will be depended on the Haryana Government Rules. Firstly visit the official website of the HSSC. Go to the recruitment block and select the recruitment option. Search link relative vacancy and click on this. A PDF will be open, candidates can save this PDF. Read all guideline for the application process and fill the online application form. Fill the application form with required details and documents. Attach the digital signature, photograph, and other necessary attachments. Click on “Submit” button after rechecking at the entries. Take the print out of the filled online form for future uses. Keep regularly visit our web portal www.jobs.chekrs.com for getting updates about HSSC सिपाही Admit Card and bookmark our page for quick access. As soon as the latest information about Haryana Police Constable Recruitment 2019 will available on our page, so you need to stay connected with us. You can give your feedback to the comment box that is given below.